"Torment" - Part 5: "Purgatory"
Batman and Bekka remain invisible until the Parademons finally move on. The Dark Knight is still having issues with his attraction to Bekka and once the coast is clear he asks her where the overwhelming feelings are coming from. Bekka explains that she is a god and like most gods is defined by a power or obsession, in her case desire. She can't explain and she can't help it and for some reason it is strongest it happens most strongly with men who have denied themselves love. Batman asks how they stop it and when she responds that the only solution is consummation he rules it out completely. He starts to explain that there are ways to get around it but soon realizes that she has left. Meanwhile DeSaad describes how the controlled Superman is retrieving the staff of Highfather from the Source Wall. It takes some doing but Superman is successful in getting the staff and brings it to Desaad. Darkseid demands that DeSaad restore his Omega power immediately but Desaad feels that he should test it out first. Batman follows Bekka's footprints and comes upon the Scarecrow being tortured by DeSaad's pet. The Dark Knight puts a stop to it to it and demands to know where Superman is. After watching DeSaad send Superman through a Boom Tube to a place beyond the Source Wall Bekka tries to kill the sadist. She fails and DeSaad retaliates by blanketing the area with a bitter cold. She finally succumbs to the attack only to be found by Batman. Elsewhere Superman wakes up in a hospital room located in a place that is a strange amalgamation of the various cities he has called home. Lois arrives and soon everyone the Man of Steel has ever known visits as well. Soon the vision fades and Superman believes it was all a dream. Suddenly Highfather appears and informs him that he should be proud but despite living a hero's life full of love, loyalty and both those worth fighting and those worth fighting for that life is now over. Story - 3: Ok, I'll admit it. I enjoyed the last few pages of this chapter. It was a neat little scene that appealed to me as a Superman fan. Burnett added a number of characters I haven't thought of in years (such as Maxima and La Encantadora) and while it was a bit odd to see the SUPERMAN: THE ANIMATED SERIES version of Jor-El and Lara (but understandable given Burnett's connection to that series) I thought it was a well written sequence. Aside from that I am still not enjoying this story. This chapter was much better than the previous one but I think my main problem is that the entire point of this particular arc is to get Darkseid powered up again. So instead of using a title called SUPERMAN/BATMAN, which may or may not be in continuity though this story probably is maybe, to tell solid and quality stories about Superman and Batman it is being used to further the ends of both DEATH OF THE NEW GODS and COUNTDOWN. I throw down my B.S. card on that. Am I saying that a title should never be used to connect to a crossover or major company event? Not at all. It can and should work. I would prefer it connect to story worth connecting to. This is my personal opinion and there are those who may not agree with that line of thinking and that's fine. Everyone is entitled to their opinion. I just think that instead of wasting six issues on a story connected to anther story that I hate that maybe DC should get this series back on track and stop making it the one Superman related title I look forward to the least. In an attempt to be positive I will repeat that this particular chapter was better than the previous one. I'm not sure I like the whole, "You have the hots for me, Batman and the only way to get over that it to commit adultery," thing, but at least the entire issue wasn't taken up with it. Burnett did a good job writing both Darkseid and DeSaad, but again if I wasn't sure that they were going to be dragged into either COUNTDOWN or DEATH OF THE NEW GODS I would enjoy it more. Despite my misgivings I am interested to see how this one ends. Burnett may do something in the final chapter that makes me rethink the entire arc. He's a good writer and knows the characters. I guess I will know in a month. 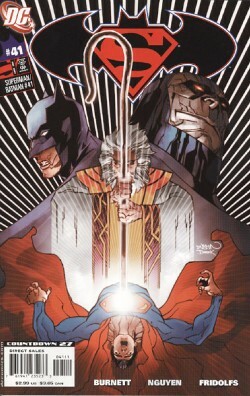 Art - 4: Ok, the art is finally growing on me and it was that final scene with Superman that turned the tide. I liked how Nguyen drew the friends and foes of Superman. I'm not sure I want him on an ongoing title, but it was interesting and pleasing to the eye nonetheless. This was the strongest issue art wise and if the past five chapters were merely a warm up than I look forward to the conclusion. Cover Art - 4: Wow. Now that's CPR. From a design stand point this cover was very strong. I liked it as a piece of art and thought that outside of the Scarecrow cover from a few issues back it is probably the strongest thus far.